Whilst to embrace these new directions and untrodden paths, which are inevitably demanding, challenging and can quite often be enjoyable, they must above all, be financially rewarding. We here at Polecam recognised these factors very quickly. The Polecam system although quite specialised in itself is a very versatile and modular tool which has meant a smooth transition in to the fields of Medical training, Industrial inspection, Religious ceremonies, Corporate events, Property marketing and more. The Polecam systems continue to be adopted and developed for use into the medical domain for filming surgical procedures for training as well as legal back-up. Specific actions and activities within the Formula one domain requiring uninterrupted and close up ultra-motion review have taken full advantage of the system. Corporate clients needing to promote luxurious apartments and properties for the hi-end housing market which more often than not, have restricted access which prevent the use of drones or similar to capture the unique extreme external shots are indeed turning to Polecam as a solution. Recently a central London penthouse apartment valued at £6million pounds and positioned 30 floors up where drones were not permitted, proved the perfect location for using the lightweight 8m Polecam over the balcony capturing the clients expectations and more. Passenger aircraft manufacturers also use the Polecam system for remote stress testing, whereby an unmanned polecam system with full remote facility can be positioned within a danger zone of a test facility, capturing all the live action with the option for instant preview playback. It's not just cranes that fall in to the diversified categories, specialist lenses have also been designed and are in operation globally in the Oceanic marine engineering environments, providing perfect images of gas vents and other activities hundreds of meters below surface. Diversify or Die! Harsh but true. Red Bull - Ultra-Motion analysis of an F1 Pitstop. Quadruple Formula One World Champions Red Bull Racing have enlisted the help of Polecam and the Antelope Pico hi-speed minicam. The challenge with an F1 pitstop is that it so many critical events happen in such a short time and they are all important. When you include, jacking the car front and back, taking wheel nuts on and off, removing and replacing wheels, adjusting wings, cleaning visors and even removing debris from radiators. And all of this has to happen in just 2.5 seconds. Tenths of a second in a pit lane can win or lose a race. When it happens in the blink of an eye but we all want to see it now - welcome the Antelope Pico. "We've worked with Polecam and the Antelope Pico before," said Al Peasland, Head of Technical Partnerships at Red Bull Racing, "....but to have the camera moved into an almost impossible position so quickly by the Polecam during our Pit Stop practice sessions within our factory, AND then instant replay, it's incredibly beneficial. Analysis after a full practice session is valuable BUT instant replay after each pitstop is visual gold. It allows us to analyse in greater detail and make changes during the same session to make our pit crew training as optimum and efficient as possible." Jonathan Wheatley is the Team Manager at Red Bull Racing. He and his team including the physical trainers for the pit crew gained valuable knowledge from the PolecamPico visit. "I've been doing pit stops for 25 years and I can't believe how much I have learnt in such a short period of time. There are things I suspected I knew and have now had them confirmed. If we're able to discover something that can save just a tenth of a second in a Pit Stop, that can mean the difference between winning and losing a race." 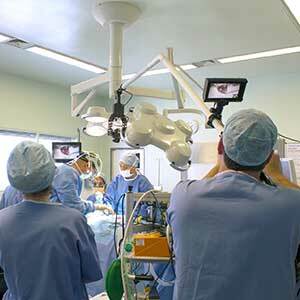 Head of the AV Team at the Royal College of Surgeons of England, Matt Thompson, said: "The Polecam system is tried and tested in the surgical operating environment. Our clients and delegates now enjoy the benefit of high-quality views from all angles when they are practising surgical techniques. The camera is easy to use and it all packs down into lightweight cases so is portable." The College's Education Directorate is responsible for creating, developing and running training courses for surgeons throughout their careers across all of the surgical specialties.